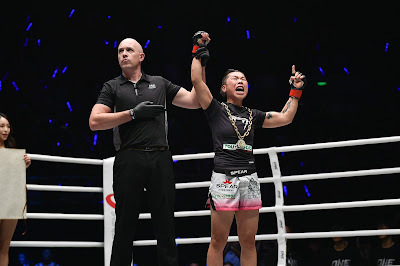 In the main event of ONE: BEYOND THE HORIZON, “The Panda” Xiong Jing Nan of China sent the crowd into a rapturous chorus of cheers by clinching a scintillating technical knockout victory over Brazilian challenger Samara Santos to keep the coveted ONE Women’s Strawweight World Championship around her waist. Xiong got the job done in the third round, thwarting the courageous Santos with a thunderous right hand. In the co-main event of the evening, Singaporean lightweight contender Amir Khan accomplished the biggest victory in his four-year stint on the ONE Championship stage, submitting former ONE Featherweight World Champion Honorio “The Rock” Banario of the Philippines. Khan finished the task at hand by compelling Banario to wave the white flag with a deep rear naked choke in the first round. A heated featherweight matchup ended abruptly when Singaporean sensation Christian “The Warrior” Lee was disqualified for executing an illegal suplex onto the head of opponent Edward “The Ferocious” Kelly of the Philippines in the first round. Kelly was unable to continue the bout, forcing referee Olivier Coste to flash the red card at Lee, signifying the latter’s disqualification. Muay Thai legend Tukkatatong Petpayathai notched his second-straight win in the heavily-acclaimed ONE Super Series, toppling Serbian dynamo Ognjen Topic via unanimous decision. The two locked horns in a spirited clash between talented and fierce strikers, peppering each other with fiery combinations. In the end, it was Tukkatatong who was able to earn the undivided nod of the three ringside judges. In front of an energetic hometown crowd, Han Zi Hao of China registered his first win under the ONE Super Series banner, defeating Stergos “Greek Dynamite” Mikkios. Han overwhelmed Mikkios with his persistent offense, clobbering the Greek combatant with a stream of powerful strikes from the opening salvo to the third round. After scoring two knockdowns in the bout and maintaining his superiority until the final bell, Han was awarded with the unanimous decision victory by the three judges at ringside. In a grueling battle between ONE Super Series debutants, Italian kickboxing sensation Mustapha “Dynamite” Haida emerged triumphant against combat sports legend Daniel Dawson of Australia by way of third-round knockout. Haida scored an early knockdown in the first round with a thunderous high kick. Although he was in trouble in the closing moments of the second round, Haida gathered himself in the third and final period, hurting Dawson with a knee to the midsection and then sending him to the canvas with a solid left straight to clinch the victory. His impressive performance earned him the GoDaddy Knockout of the Night. 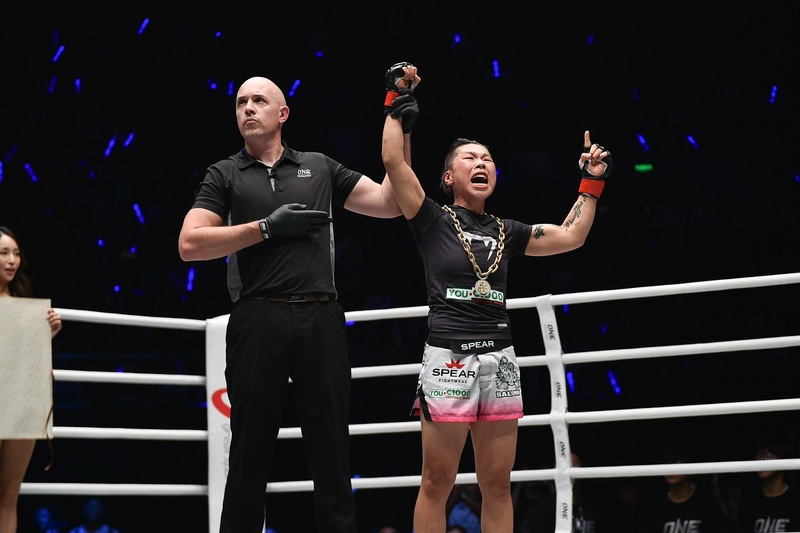 Despite the seemingly insurmountable odds, “Jungle Cat” Muhammad Aiman of Malaysia pulled off the upset victory, handing hometown hero Chen Lei the first defeat in his professional mixed martial arts career. Aiman had to overcome a hot start from Chen, who dominated the Malaysian standout with his grappling expertise. The complexion of the bantamweight encounter took a drastic turn in the closing moments of the second round when Aiman caught Chen with a staggering knee strike. Aiman then hopped onto the back of Chen, fastening a body triangle before wrenching his opponent’s neck with a rear naked choke. Aiman had no intention to let go of the submission hold, increasing the pressure until Chen tapped out. In the first ONE Super Series bout of the night, Hakim Hamech of France cruised to a huge knockout win over Japanese champion Yukinori Ogasawara. Operating behind a sound game plan and well-placed strikes, Hamech dropped Ogasawara with a monstrous right hand with less than a minute to go in the opening period of the contest. Ogasawara was able to beat the count of ten, but he struggled to find his balance. Hamech capitalized on his foe’s dazed state with relentless punches to notch the knockout in the first round. Setting the tone for an action-packed evening was a three-round strawweight clash between Indonesian wrestling champion Elipitua Siregar and highly-decorated Kun Khmer practitioner Phat “Ice” Soda. Driven to claim his second-straight victory as a mixed martial artist, Siregar made quick work of his opponent, raining down heavy blows on the mat to force the stoppage.